Anyone have any Experience with Willie Mays IP w/ Auto's? Thread: Anyone have any Experience with Willie Mays IP w/ Auto's? I'm going to a card show next week and I'm going to have Willie sign a APOH 500 Club Card. I know he doesn't have the best reputation at these paid signing shows. Has anybody had any recent experiences with him at autograph shows as far requesting him to change a pen in your preferred color for your item? I would like to have my card signed in blue but I hear sometimes he won't switch. A's a side project I am trying to have the 500 guys sign their APOH 500 cards. I have McGwire,Thomas and Sheffield so far. 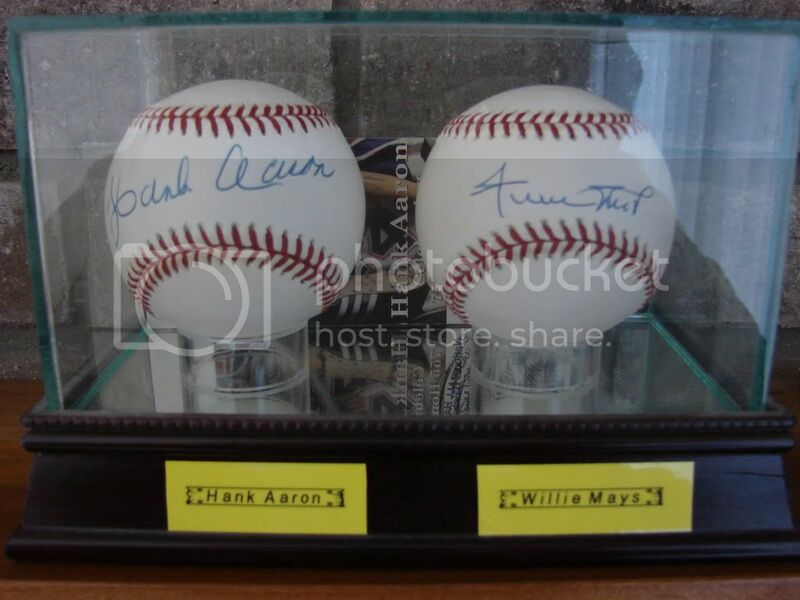 Re: Anyone have any Experience with Willie Mays IP w/ Auto's? Hopefully not on the back, i have heard horror stories. Its a shame he was one of the absolute best to ever play the game. We had a pretty lengthy thread about a year ago regarding Willie's behavior when signing. The responses in that thread varied greatly. My experience with Willie Mays was fantastic. He signed 3 OMLBs on the sweet spot for me at the 2001 (or was it 2002?) National in Cleveland. He wore a 1999 HOF induction hat that day. 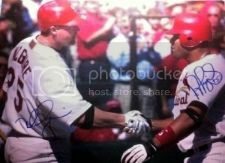 As he started signing, I commented that I attended the '99 induction and that I saw him there. I then asked him if he was going to the induction that year which was about two weeks later at that time. He gave me an enthusiatic, "Oh yeah!" I can't remember much of our short conversation. It was just small talk. He gave me three perfect signatures on the sweet spot at $75 per auto (Hammerin' Hank was $65 per auto that day). When he was done, I thanked him for coming and he thanked me as well. I think you will do alright. Just treat him with proper respect like you would with any elder. Do the little things like look him in the eye and call him Mr. Mays. nice balls man. never thought i'd say that. Archie, I'm not disagreeing with you or disrespecting you in any way, but I just think that it's funny that people have to follow Soup Nazi-like rules when paying $200 (I'm too lazy to look it up, but I think this was the price at last year's National) to have someone write their friggin' name. I got a card signed for birdsfan85 last year. Willie signed many baseballs with black sharpie, and pictures with a bad silver pen. I handed over the card and a nice pen. His assistant had to fight his sharpie off with my pen as he ignored my request to change pens. Luckily she was able to stop him. He completely ignored most fans. Immediately after he was done signing he had a conversation with Michael Bourn and Reggie Jackson. He was very animated crouching over and throwing a baseball. He really didn't seem to give a crap about fans that day even after he received a standing ovation upon arriving. The trick to Mays is don't be the first in line.That way you get to see how he is interacting with the fans. I have met Mays numerus times over the past 3 years at shows and every time he was very nice, polite and talkative. One of the last times I saw him though I wanted him to sign my cards in Blue sharpie and he had a black sharpie in his hand so I just took the black one out of his hand and put the one I wanted in it and he signed perfectly. Although at the last signing with him, he started signing my card right where I wanted him to but towards the end he trailed off and almost went off the card. This wasn't on purpose as he really is almost blind and afterward he even asked me if he signed it ok and if not he would sign again, I just said no it was fine. I'm also going next week and am going to get him again and hope everything goes well. Its funny you mentioned the APOH Mays bat card as I just got that in this week from ebay, its a beautiful card! yea man, i hope it goes well. Pray for my APOH card in blue! I appreciate your comment and I agree with you as well. In Willie's case, he just has some quirks about him. Dont hand your card over until Mays has the correct pen in hand, then you should have no worries. He will have an assistant there, be sure you tell that assistant exactly what you want. I know they cannot force Willie to do what you ask, but they are their for a reason. If you are dropping hundreds of dollars for an auto, you better get what yu ask for.